Our self-guided walking tour is a leisurely stroll covering twenty sites. It starts at the Issaquah Visitor’s Center on Gilman Boulevard and ends at Issaquah’s Historic Depot Museum. If you are starting at the Depot, just take the tour backwards! You may also want to visit Gilman Village, a unique shopping center created by moving historic houses and retail buildings to a site on Gilman Boulevard just west of the Visitor’s Center. Hard copies of the brochure available at the Issaquah Visitor’s Center, Gilman Town Hall Museum, the Issaquah Depot Museum and other locations. You can also download and print a PDF of the tour. In addition to the twenty sites that make up the official walking tour, you can explore many other buildings and sites in historic downtown Issaquah (virtually or on foot). The sites are described by number beneath the two maps. You can click on any map number to automatically scroll down to the site’s description. The Alexander House was built in 1902 by Thomas and Caroline Alexander on land that was known for most of the century as Alexander’s Resort. The couple originally moved to the area when Thomas was employed by Seattle Lakeshore and Eastern Railway as the “walking boss” or traveling construction supervisor. When the future of this historic home became endangered by construction of a housing development in 1986, the Issaquah Historical Society worked to move it to its current location. Issaquah’s dairy plant has operated continuously since 1909, when it was opened by local businessmen as the Northwestern Milk Condensing Company. The company condensed milk, manufactured butter, made ice, and canned fruit and vegetables for the Seattle market. Today the plant is operated by Darigold. In 1995 a mural commemorating Issaquah’s dairy industry was painted on Darigold’s Front Street wall. Prominently depicted is the creamery as it originally appeared, the Pickering family’s dairy barn and farm, and the Lake Sammamish scow that once transported milk. As you pass over the bridge next to the Creamery, you see the East Fork of the Issaquah Creek. The East Fork meets Issaquah Creek about 500 feet to your right (to the west of the bridge). Issaquah Creek proper is visible near the State Salmon Hatchery. This branch was once called Mill Creek. The Grange Mercantile Association was organized by Issaquah Valley Grange No. 581 in 1915. This building served as a cooperative store, and was constructed to fit between the railroad tracks and Front Street. 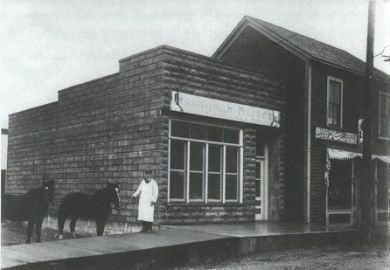 The Mercantile Association served the food needs of the Issaquah community for 57 years before closing its doors due to economic pressure in 1972. Although the building now has other uses, the Issaquah Valley Grange continues to meet regularly. From the pedestrian walkway, you see the Issaquah Depot from the perspective of a turn of the century traveler, arriving by train. Gilman (later Issaquah) was on the Seattle Lake Shore & Eastern line, which ran from Seattle to Woodinville, south through Redmond, and on to North Bend. The Depot was completed in 1889. Northern Pacific eventually took over operation of the Depot and rail line. After the Depot was closed in 1958, it was used as a warehouse. In 1984 the City of Issaquah purchased the old Depot and the Issaquah Historical Society spent ten years restoring it. Today the Depot looks much as it did while in use, down to the distinctive red paint and green trim of the Northern Pacific Railway. Listed on the National Register of Historic Places, the Depot also houses a museum which is open to the public Friday, Saturday, and Sunday, 11-3. 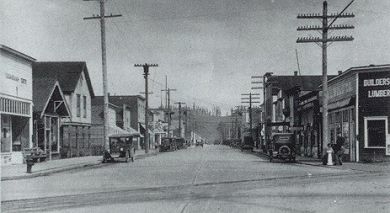 When Gilman was first incorporated in 1892, Sunset Way was known as Mill Street because lumber mills were located at either end. This mural depicts Issaquah’s logging industry circa 1900-1940. At this time, old growth cedar and fir logs were being cut from the hills surrounding Issaquah and milled in the town’s many lumber mills. When the Grand Central Hotel was constructed, Issaquah was a stopover point for passengers traveling by train from Seattle to Snoqualmie. James Henry Croston, Sr., who worked in the mines as a carpenter, built the boarding house and operated the hotel until his death in 1913. The Grand Central Hotel served as a temporary home to many of Issaquah’s future residents while they established their homes and businesses in town. This building was originally constructed as a public hall, and was purchased by the Town of Gilman in 1898 for use as Town Hall. It was the Town Hall until 1930, and also served at varying times as courtroom, school house, church, library, polling place, and fire hall. It was also rented out for boxing and other physical activities by the young men of the town. Today the building is owned by the City and leased to the Historical Society for use as a museum. Exhibits change often and feature the toys, tools, and treasures of Issaquah’s past, both near and distant. Museum hours are 11-3, Thursday, Friday, and Saturday. Prior to 1914, the town marshal locked up miscreants in a wooden jail located near the site of the Masonic Hall. Legend has it that one night the jailer locked up several inebriated loggers and neglected to remove the men’s hobnail boots. They were able to kick the wooden jail down. The town’s second jail, a very solid two-cell cement structure built behind the Town Hall, proved far more durable. It was in use until 1930. At the center of the display is a road engine, like those used throughout the area in the late 1800s and early 1900s. Road engines were used to skid logs long distances (up to a mile) toward a central point or mill, where they would be either milled or loaded on rail cars (later trucks). The engines were commonly called donkey engines because they did work previously done by animals, such as mules and oxen. The Issaquah Trail Center, owned by the City, is the Issaquah Alps Trail Club’s headquarters. The house that once stood on this site was built around 1900 by Wilbur W. Sylvester, although he never lived there. Sylvester, a prominent and influential citizen of early Issaquah, founded the Issaquah State Bank. He was also the third station agent at the Gilman Train Depot from 1895 to 1899. When he resigned to found his bank, Sylvester stated, “I am going to try and increase the business by building up the town.” When the City decided to restore this home to be used for civic purposes, the building’s condition was so deteriorated that the best option was to rebuild it from scratch. Facing south from the Trails Center, you will see the mountains known as the Issaquah Alps. Left to right, they are Tiger, Squak and Cougar Mountains. Whether topped with snow, shrouded in mist, or covered in spring growth, these mountains provide a beautiful and distinctive backdrop for the downtown area. The mountains also played an important role in the early mining and logging history of Issaquah. Trees growing on the mountains today are second and third growth, having been logged earlier in the city’s history. This home was built by John and Ida Gibson. John Gibson operated the town pharmacy, served as postmaster for 30 years, and was elected mayor of the town from 1915-1917. Typical of circa-1900 architecture, the house was saved from demolition by a City Council action in 1996. It is now used as a City Parks office. Dr. William E. Gibson, town physician in the late 1800s and long-time mayor of Issaquah, planted this rare Ginkgo tree around 1900. The house Dr. Gibson and his family once lived in was also located on this site until it was torn down in 1970. Fortunately, through the efforts of Issaquah High School students, a petition was drawn up and the tree was saved. This site was once part of City Park. It sported a bandstand and speaking platform for large holiday celebrations and many townspeople enjoyed picnics along the creek. During the Depression, the Works Project Administration constructed the State Salmon Hatchery. Every fall, 10,000-20,000 salmon return to this site to spawn. The best time to visit is late September and October, spawning season. Issaquah Creek, once known as Squak Creek, flows to Lake Sammamish and ultimately into Puget Sound. This intersection marks the boundary where four early – and notable – Issaquah land claims met. In 1862 Lyman B. Andrews discovered coal in the nearby mountains. Shortly thereafter he filed a homestead claim at this site. In 1867 three Norwegian bachelors filed adjoining claims. Instead of building three homes, the Wold brothers and Jacob Jones erected one cabin at the common corner. From 1910 to 1923, a rail spur from the Depot to the mines passed at an angle through this intersection, which explains the angular gap between the Wold Building and its neighbor. For 81 years this building belonged to Gilman Lodge #69, Independent Order of Odd Fellows (IOOF), which operated the upper story as a community hall and rented out the lower story. The hall has been the site for dances, movies, a grocery story and even court proceedings. It was nearly destroyed by an arson attempt in 1908 and by a severe windstorm in the 1930s. The building has been well maintained and remains a distinctive Issaquah landmark, appearing much as it did in the 1890s. This building was constructed in 1910 to house John W. Finney’s Meat Market. The Peters Agency real estate business and Allstate Insurance succeeded Finney as occupants of the building. John Fischer, once an employee of Finney, opened his own meat market next door. Fischer’s Meats is still in business. W.W. Sylvester constructed this building to house the Bank of Issaquah. He insisted on an 11-foot wide sidewalk, which meant the building sat back from Front Street three more feet than other businesses. Sylvester later talked neighboring businesses into constructing their buildings back three feet as well, resulting in wider sidewalks on one side of Front Street. The original building featured ornate detailing on both the outside and the inside. It has been renovated several times and held a number of different businesses. Rufus H. Glenn came to Issaquah in 1912 and opened the first theater in town. This building became its permanent home. A fine example of early pioneer wood construction, the building has housed silent films, basketball games, school dances, and graduations. During the late 1960s the theater was remodeled and the Issaquah Theater Group began using it. The theater reopened under the name Village Theatre in 1979. This building is now used for the Village Theatre’s First Stage performances, while Mainstage shows have moved across the street to the Francis J. Gaudette Theatre, 303 Front Street N.